The Mind Body Project — The Mind Body Project Events Mindfulness for REAL people. In our first ‘The Iron Mindset’ program, we learned to combine basic brain science techniques with journaling, breathwork, gratitude, meditation and mindset practices. “I’ve never had the breath, body, mindset connection explained to me like that. It has really changed my perspective on the importance of breath. More Brain Science, including how your vibe attracts your tribe! COST: 250 non-members/150 TIM members. *Tea, snacks and mats included. Advance payment requested. RSVP Required: Please contact Rhain at 083-472-7761 (What's App or Cell), theironmovementsa@gmail.com or this page. No experience necessary, friends welcome. Come with an open mind, notebook and comfy clothes. Take time for some well-deserved self-care with a restorative series dedicated to cultivating love and healing from within. In this passive practice, restful, relaxing poses are held for longer periods of time with the support of props. This helps to find to find stillness in the mind, triggering deep relaxation, reducing stress and anxiety. The longer holds also help us delve deeper than muscles to open up the connective tissues of the body. As parents and caregivers, we often sacrifice our own care for the sake of others. This series makes self-love and care a priority and will bring understanding that when we truly love and accept ourselves, we are able to love others more fully. More Details. Former Beijing expats, great friends and female business owners, Aveleigh Gateman of Nametag and Erin Henshaw of The Mind Body Project are teaming up to offer an international collaboration for women leaders in Cape Town! (This is an all levels program for all humans!) Aveleigh and Erin combine experience in the worlds of mindfulness, start-ups, company culture and leadership to create a balanced and inspirational day of relaxation and goal-setting. 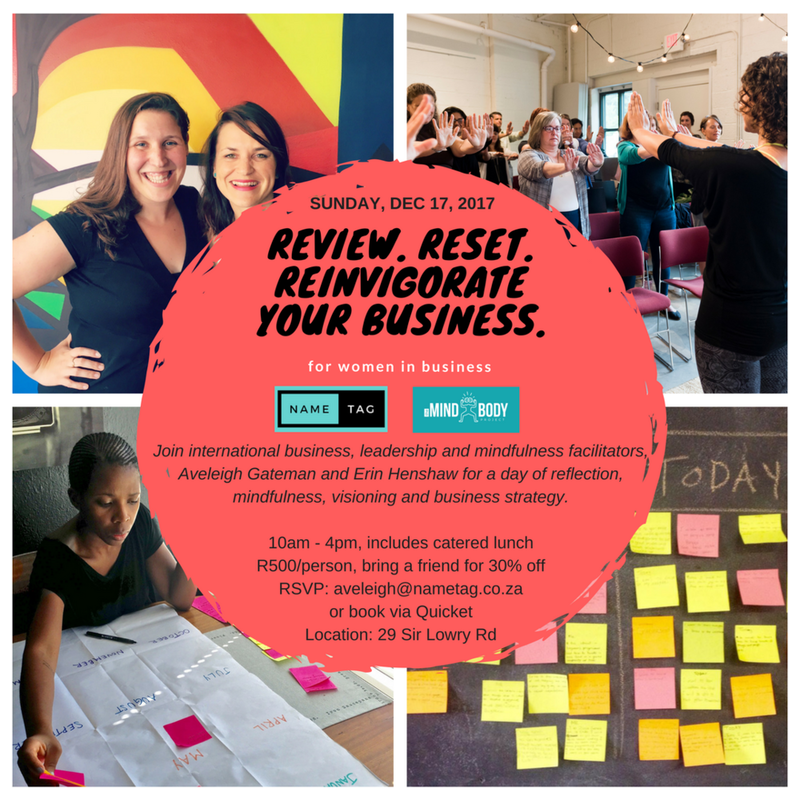 Join a vibrant group of fellow evolvees to review the year, reset our minds and bodies, and reinvigorate our passion for 2018.
Review. Reset. Reinvigorate your Business. Former Beijing expats, great friends and female business owners, Aveleigh Gateman of Nametag and Erin Henshaw of The Mind Body Project are teaming up to offer an international collaboration for women leaders in Cape Town! (You don't need to have your own business, just an open mind and willingness to share.) Aveleigh and Erin combine experience in the worlds of mindfulness, start-ups, company culture and leadership to create a balanced and inspirational day of programming. Join a group of inspiring women to review the year, reset our minds and bodies, and reinvigorate our passion for 2018. 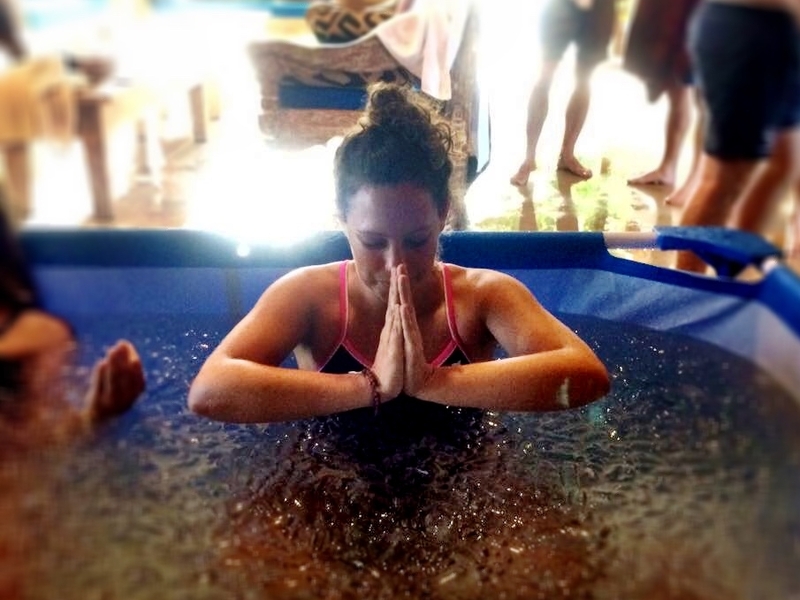 Co-founder Erin Henshaw spent the summer in Bali, practicing applied breathing techniques, such as "Breathe-Up" for free diving and the Wim Hof method for cold exposure. "I wanted to learn these techinques because I have been uncomfortable under water and in the cold my entire life. I thought that Free Diving and Cold Plunges would be a fun challenge, but they actually changed my entire relationship with fear and anxiety." Join Erin on Sunday, Dec 3rd at The Yellow Door for an introductory workshop that will include breath to calm the nervous system, underwater visualizations and heat-building techniques to decrease inflammation and enhance our ability to withstand fear and cold. Boom! Long-time Beijing expat and Co-Founder of The Mind Body Project, Erin Henshaw has spent the past two years in the US, teaching yoga and mindfulness in elementary schools and companies. She currently teaches for the University of Virginia and recently completed a year of entrepreneurial studies at the Darden/Batten iLab incubator. Erin is back in Beijing for a month and excited to share her unique programs which are influenced by her yoga, neuroscience and breath-work studies in India, China, America and most recently, Indonesia. Plain and simple, breathwork changed my life. As a busy start-up manager and general over-achiever, I never took the time to slow down. Breathwork helped me gain control over my mind, body and life in a radically new way. After practicing years of breathwork for yoga, meditation and endurance sports, I decided it was time to test my skills. This summer in Bali, I learned breath preparation techniques for surfing, free-diving and climbing Mt. Everest! I unlocked parts of my brain that continue to infuse my every day life with less fear and more calm, clarity and happiness. Co-founders Erin Henshaw and Brittany Dunn will combine forces to offer the ultimate mind body experience. Come in your sports clothes and get ready to participate in an event that will challenge your perceptions as a leader. This experiential program will help us analyze self-talk, healthy habits, stress response, brain plasticity and resilience in the face of daily challenge. Please bring exercise clothes, sports shoes, water and a towel. Our intention: To facilitate an incredible week of learning and sharing with an international community of inspiring people (yogis, teachers, expats, explorers, entrepreneurs and more) who want to practice mindful habits to enhance their lives and the lives of everyone in their presence. "Collaboration is not about gluing together existing egos. It's about the ideas that never existed until after everyone entered the room." $110/night including all activities, breakfast and some additional meals. $40/day for day programs without accommodation. The Mind Body Project isn't seeking profit from this event, but rather covering our costs to organize and collaborate. You may stay for a flexible period within the July 14-22 time frame. Invite friends! Families and children ages 12+ welcome. 1. Email erin@themindbodyproject.com for a pre-program survey and any outstanding questions. As part of our Karma Yoga, all classes are free and day programs are self-pay. Friends welcome. We don't have mats, but bring a towel for comfort, and feel free to stay after at the cafe for lunch. Please RSVP definitely for yoga therapy and tentatively for classes. (erin@themindbodyproject.com) We are happy to meet people at a known location and guide you back to us! Personal + Professional Reflection. What did we do? What did we learn? Wear this shirt to remind the world that a mindful world begins with kindness. Over the past three years, The Mind Body Project has offered mindfulness programs to schools, companies and communities from China to the USA. To date, we have worked with Lululemon, Bloomberg, the University of Virginia, Ivy Schools, The Langley School and more. We personalize science-backed breath, movement and intention programs to help people stress less and live more. Our focus is to enhance resilience and focus, and plant seeds for better mental health. This year, we will continue incubating our programs at The Yellow Door in Virginia and The Red Door in Beijing, create instructional videos and curriculum, and broaden our scope of offerings. Inspired by Sharon Salzberg, our 'REAL Rebels' campaign was created to spread awareness about how we can re-wire our brains for kindness. We'd like you to buy a shirt (or a few) to fund development of a mindful future, and to remind everyone that kindness towards ourselves and others is essential towards creating a more peaceful world. It's time for a gathering of wonder women. As you may know, co-founder Erin Lee Henshaw is off to Indonesia and China for the summer, but would love your company and inspiration before she goes. Come for any/all. 6pm: Pick up food from downtown mall. The Mind Body Project is teaming up with Mindful Mornings to offer their first Charlottesville-based, heart-oriented meet up! 8:00 a.m. // Doors Open. Grab Coffee, Kombucha & Breakfast. 8:20 a.m. // Speaker Introduction. Keynote. Compelling Conversation. 9:15 a.m. // That's a wrap! If you join us on June 16th you can expect to enjoy a delicious breakfast array from the local food advocates and craftspeople at Carpe Donuts, coffee from Carpe Cafe inside Studio IX, and kombucha to tantalize your taste buds and plant good bacteria in your gut from the kind humans at Mountain Culture. Then kick back and enjoy the beautiful co-working and event space provided by the kind folks with Studio IX. Humans of all ages learn through story; it’s the easiest way for our brains to integrate diverse experience into personal balance and well-being. We usually think of story as a function of the mind, but our personal narrative is also accessed through the wisdom of the body. Join the Mind Body Project to relax and recharge while using mental and physical storytelling frameworks to help us understand: How can I use somatic tools to create an authentic version of my personal story and purpose? Jess, Erin and Maggie bring their unique backgrounds in personal and corporate storytelling, professional writing, start-ups, international travel, mind body experience and real life fun to an afternoon of reflection on our personal narratives. Through thought-based and embodied frameworks, you will walk away with a personal story that describes where you’ve been, who you are, and where you want to go. *Want to host us in DC or another location? Email a request! Cville Yoga Brunch! REAL people. REAL food. REAL good. *All ages. Limited to 20 guests per class. Erin Lee Henshaw is an international start-up consultant specializing in corporate culture, digital marketing and community building. Erin founded The Mind Body Project in Beijing in 2015 to bring mindfulness to REAL people. Want to meet the whole Charlottesville team?! We'll also be outside of the Founder's Summit at the Paramount from 9am-4pm Friday, April 14th! Come say hello. Sunday Jan 22 The Mind Body Project and The Juice Laundry present: Cville Yoga Brunch! REAL people. REAL food. REAL good. The Mind Body Project and The Juice Laundry (www.thejuicelaundry.com) feel like there aren't enough healthy community events where people can come to be themselves, connect and smile. We're hoping to change all that with a bit of movement, clean food, and an inviting space to make brains and bodies feel real good. Join us Monday, Jan 2 from 10am-2pm for our signature one-day Recharge Retreat with Barre.d. Mats, lunch, and tea provided.